And a darned good one, at that, so that he’s temporarily unable to use the seemingly endless collection of gadgets that he is so renowned for owning. But why should I say such a mean-spirited thing? Isn’t this person a national treasure whom I’m suggesting doing a frightful mischief to? And why, pray tell, is the very way that I am writing this post somehow being imbued with the very embodiment (oh that I should be so bold) of Mr Stephen Fry? If I’m not mistaken, I can even hear him saying these very words in my ear as I type and picture him mouthing the sentences that appear to be spewing forth on to the page. I’m not quite sure if I can keep up these linguistic gymnastics. I’m referring to the wossy effect and by that I mean that after Stephen Fry appeared on Jonathan’s return (inaugural?) Friday Night show discussing Twitter, he is now the darling, nay the poster boy, of microblogging service Twitter. He was, by all accounts, a must-follow celeb long before that TV appearance - and one who does really seem to get what he’s talking about. When Stephen Fry talks, 84,000+ people listen (at the latest count). Or read, if one is to keep the pedantic nature of this blog post up. Or do they all read? Perhaps there are people who hear Stephen Fry’s tweets, albeit from a rather robotic voice that really doesn’t do the chap’s fine speaking voice the justice it truly deserves. Of course, there are such people - blind users, primarily, but perhaps others with less severe vision impairments who may also need some other form of assistance also. But I am rather going off the point here, that being that Stephen Fry has, by design or by accident, become a rather unlikely voice for the technorati of the world. Who would have thought that this mellifluously-voiced thesp could, with just a small handful of (sub 140-character) comments (to wit: "shockingly bad") about a mobile phone cause such a worry to the marketing people at Blackberry? Just as well that another much-followed Twitter user is able to counteract the negatives with his apparent love for said device? Getting back to my point - not that it’s clear I even have one yet! - what I’m alluding to in the headline is that if someone like Stephen Fry were to suddenly lose the ability to use one or more of his much-loved gadgets, laptops or whatever, his frustrations with inaccessible devices and web sites would very soon become very public knowledge; he would, I’m sure, soon be explaining to the world at large exactly what these frustrations are and would possibly even have a solution or two up his tweed-clothed sleeve. We may have our ‘web accessibility rock stars’ who have their respective followings, but it is still somewhat akin to me saying “I’m world famous … in Swindon” (also not true). Outside of this little bubble, we have no real power to speak of and can quite easily go about our shopping chores without being bothered for autographs. Even bona-fide web standards gods like Jeffrey Zeldman are unknown to the vast majority of people, shocking as it may seem to some, making it a genuine surprise when ‘normal’ people recognise them! Stephen could talk about accessibility issues and 84,000 people, at least, would listen (or read). And perhaps some of those 84,000 people would the re-tweet what they learn, others might go and investigate further. A large majority would still ignore it and carry on searching for the next Twitter-spawned link to that day’s YouTube must-see funny, but the message of what it is to be denied access to information on the web would spread further. It wouldn’t be the first time that Mr Fry has found an unfortunate injury get in the way of using some piece of technology or other (I believe this broken arm caused some problems in getting together an episode of his podcast, or ‘podgramme’ as I believe is the moniker he prefers). So, what I’m saying is if you see Stephen Fry, give him a poke in the eye (preferably both) but after you do, ask the good chap if he wouldn’t mind awfully conjuring up a blog post (or blessay) about the dashed awkward consequences of this terrible eye-poking incident. Legal bit - of course I’m not suggesting anyone actually harm him! Stephen - if you want to skip the injury part, that’s cool, but we’d really love it if you were able to spread the word about web accessibility on different devices/platforms. One of the things I wanted to do with the rebuild and restyle with Accessify was to make it a little more slimline in terms of HTTP requests (in other words, fewer requests for style sheets that are not needed - one CSS file to do the lot) yet still support other devices. I have to confess that while there is just one CSS file (which has a far future expires cache setting on it so as not to cause needless reloads), which does include screen and print styles, I’ve only really taken care of the mobile display on the iPhone, mainly because that’s what I use and have found easy to test on! The thumbnails below link through to larger, annotated images (PNG) format, showing how subtle changes to font size can make the site much more readable/usable on a small screen device but without ditching the entire style sheet. Depending on the style of your site some of this may be easily do-able, some of it may not. Your mileage, as they say, may vary. So, like I said earlier, nothing too earth shattering here - just an exercise in giving your style sheets just the slightest of tickles to make the site markedly easier to read on a small screen device but without resorting to a completely different style sheet or no style whatsoever. Now, I need to go back and read that article and see what I cab do for other handheld devices. If anyone can point me in the direction of some emulators that I can run on my Mac, I’d really appreciate it! Just a quick question, when will the RSS feed be back up and running i am getting a 404 when i try to access it? So said the email I received today. So, it looks like this has been down ever since I relaunched the site. I guess it makes sense that I hadn’t got any feedback from long-time RSS subscribers! I’ll put in an automatic redirect very shortly. For now, though, please reset your news feed (if you already have one). Thanks! When I put a competition on the web site for just 5 copies of the book, I wasn’t sure what to ask as a competition question. I didn’t want to ask anything too hard/tricky, so I left it quite open and decided that the way to win a copy was to entertain me with some creative writing - just as I found it really funny the way that people would draft over-the-top creative begging letters on Freecycle. It’ll be fun, I thought. 250 entries of creative writing later, and I have a very different opinon. I wish I’d gone for a simple closed question along the lines of "what does HTML stand for" and then just done a lucky dip! admitted being senior people in their respective industry, responsible for web … and not having a clue what they’re talking about! Then there were quite a lot of emails which seemed to be genuine tales of woe - too many for a measly 5 copies to help out with! I really started to feel how difficult it must be for people working in charities having to turn down requests for help for things a lot more important than some (in comparison) silly little book. Now, because there were so many funny entries to the competition, I’ve selected some of my favourites and collated them here. Once again, I’ve removed the authors’ names to save them from any potential embarassment, and have also scanned through to make sure that there are no other personally identifiable pieces of information. Thanks to everyone for taking part - it’s been fun … but I’ll definitely go with the closed question approach next time! Please note - this competition is now closed and I’ll be drawing the winners soon. It’s going to take a while to read through the entries - 250 in total, wow! 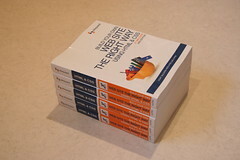 I’ve got some promotional copies of my beginners web development book ( Build Your Own Web Site the Right Way with HTML & CSS ) that I’m just itching to give away to people who can guarantee them some good homes. I understand that, for the most part, readers of this site already get standards and are probably beyond learning what I teach in this book, but the chances are that you know people who would benefit from learning from this book, people who have asked "How can I learn this web thing that you do?". Here’s a book that you can pass on to them, safe in the knowledge that they’ll learn good techniques to begin with. Andy Clarke did just that for his son, Kevin Yank did the same for his wife. You can find out what others had to say about the book here. How can you win a copy? The closing date for this is Friday 23rd January (0900 GMT) - after this point the email address above will no longer be active. I’ll pick five winners soon after (as long as it takes me to read them all - 80 and counting so far!) and contact directly to arrange a shipping address. Good luck. Finally. At last! [insert similar phrase of own choosing here] … It’s done! It’s taken me an absolute age to get this thing live and, if I’m completely honest with myself - and anyone else who happens to be reading this now - I’m still not totally happy with the end result. You see, I’m not much of a designer, and cannot help but criticise my own efforts (and I sure as hell know that others will want to take a shot at the ‘design’ of this). But hey-ho, one has to know his own limits! I’ve needed to take a look at this site for so long but unlike many of my peers, I don’t actually live and breathe web development and (despite what my wife may claim!) I don’t spend all of my free time on the computer. The truth is, I usually have something like a 30-minute to 1-hour window of opportunity late in the evening to really concentrate on this kind of thing, when everyone and every animal is asleep. But by that time I’m tired too. And that, my friends, is why it’s taken me years to get around to giving the site a facelift! Skipnav Builder - builds skip navigation links! Some new content! Yes, the site is still there largely for the purposes of holding the tools, but in these days of micro blogging, perhaps it’s time to buck the trend and do some fuller postings? With a site that I’m happier to work with, this is far more likely to happen! I hope that visitors to the site like the change and find something of use here. I’ll really do my best not to let this stagnate from here on in, I promise!